A lot has been said about E150-a, better known as spirit caramel. About its usage to adjust colour to bring various batches within the same visual standard year-in, year-out. About the fact it will not affect the taste at all. About the purists who say caramel destroys the taste completely so all coloured whiskies should be avoided at any cost. Average Joe can’t be bothered and because he represents about 90% of the whisky market the conglomerates will continue to use caramel with legitimate commercial reasons: ‘Costumers are very attached to their brands and expect them to be the same for years and years and years.’ How right they are. The purist camp will not go with that, saying: ‘Caramel, or better E150-a is not generated by distilling or wood maturation and is therefore a non-natural thus a destructive element in whisky.’ How right they are. That’s why we took up the challenge and created ‘The Big Caramel Experiment’. Maniacs Klaus, Thomas, Serge, Charlie, Alexander and me, as well as malt sponsor for this experiment Dirk van Staden of ‘Liquid Gold’ have challenged their tastebuds in an attempt to clear up those hazy skies around the subjects on caramel. In this experiment we want to find out what caramel exactly does to whisky. Is it, as the chemists say, ‘organoleptically inert’ – not detectable by nose and taste? Does it ruin your precious dram of let’s say: an Arbeg 31yo OB Manager’s Choice for France? Is there a threshold for the use of caramel? Let’s start with E150-a itself. As the code suggests it’s a generic colourant. E150 is available in four different versions ranging from E150-a to E150-d. Each is created for specific purposes. E150-c is the best known, it’s what gives your Coke or Pepsi its colour. E150-a, important for us, is quite special because it has to do its work in an extreme environment: a liquid which contains a minimum of 40% alcohol and on top of that it has to be light-proof for a longer period of time. You can’t have your whisky separating or losing colour after a few weeks on the shelves in your shop. It’s made by controlled heat treatment of sugar, with or without the presence of alkalis or acids. Another ‘special feature of E150-a: it is not obtainable for mortals like us. Fortunately Diageo PLC was very happy to provide us with a 200ml bottle of E150-a. E150-a is a highly viscous liquid, it took several days to settle down in the bottle. The colour is almost opaque black. Against the light a thin film of E150-a will show as a deep, brownish red colour. The smell reminded me of roasted raisins, ground coffee and burnt bread. A minute quantity of E150-a is enough to give a one litre bottle of water the looks of a ‘Dark Sherry’ maturation, so our 200ml could be used to colour a small loch! Now for the test – in itself quite a simple one. From not coloured to heavy coloured or the opposite way, from heavy coloured to not coloured. This has to be done three times for the nose and three times for the taste, so any lucky guesses will be smoothed out in a greater total. 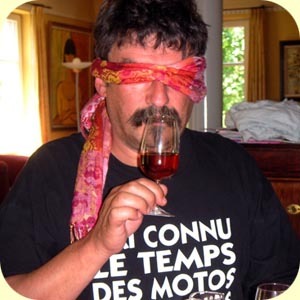 All nosing and tasting is done blindfolded and an assistant is to give the different coloured samples (of the same liquid) in random order. For the colouring we had to dillute one part of E150-a with four parts of water to create a more workable fluid. To make life a bit harder the taster gets one chance and one chance only to put an at random presented sample on the right spot in the sequence. The liquids for colouring are plain water, a Lowland malt, a Highland malt, a Campbeltown malt, an Islay malt and a blend of the former four malts. I think it’s obvious that the selected malts have to come from refill casks so we can be as safe as possible to have malts that have a preserved distillery character. The honours for the Lowlands are taken by a Rosebank 1990/2003 (46%, Helen Arthur, cask #486). The highlands are represented by a Clynelish 13yo 1990/2004 (43%, Van Wees ‘Ultimate’, cask #12733). Campbeltown by Springbank 10yo 1993/2004 (50%, DL OMC, cask #628) and Islay by Bowmore 11yo 1992/2003 (46%, SigV UC, cask #4229). With this line-up we think we have a solid, general coverage of Scottish malts. In the tradition of the Malt Maniacs points are given in this test. 3 points if the arrangement was put in correct order. 1 point if only one sample was given the right place in the sequence. For 5 sessions that makes a maximum of 30 points for each taster. Due to excitement Alexander forgot to read these lines and renosed and retasted the samples over and over before putting them into a sequence. Even with this foul play he got one sequence false! Good for him I’d say… It means however that the scores from Alexander are not included in the results of the experiment. Luckily for all of us Alexander was the only maniac to present extensive tasting notes of the different coloured samples. You will read them at the beginning of each malt cluster. First let’s try to find out what E150-a does with the smell and taste of water. Alexander made the following notes: ‘Nose: (1-neat) Herbal, Citrus, Lemongrass, A bit sour, Fat make-up powder. To decide if it’s the medium coloured or the heavy coloured is a different case altogether. As with the springwater a very distinct sharpness in the finish made it fairly easy to detect it as ‘heavy coloured’. A more ‘sturdy’ malt for this session. Would it be powerful enough to withstand the overwhelming caramel? Clynelish and caramel definitly don’t go well together. Huge inbalances and more nastiness happening in the glass. Bring in the peat. Will E150-a finally see its defeat? A very interesting thing happened when I prepared the Bowmore samples. Altough I used the same amount of caramel Bowmore coloured much darker. I have no explaination for this strange behaviour. Alexander’s notes say this: ‘Nose: (1-neat) Added organic element that must be covered up in the other samples. Still mild peat, more balanced, Fishy Islay (2-medium colour) More perfume lifted by sharper alcohol to carry it, sea, less peat ? Bitter, Mild Islay. (3-dark colour) Dead, Peat, Sea, Perfume, Sweet, Not bad. Taste: (1-neat) Sweet, Liquorice, Cleanest taste, Most balanced, Syrupy finish, Nicest finish, Still not the most complex around. Could have been a Caol Ila at some points. (2-medium colour) Deeper and more complex. Sweet, Peat, Sweet again, Warming, Improved finish. (3-dark colour) Flat, Peat, No complexity whatsoever, Licquorice, Ruined finish. This was the sequence Dirk and I enjoyed the most. Almost impossible to ‘put your finger on’. ‘I nosed and tasted ‘straight’, then added one third as much water, to bring down the ABV to approx. 30%. Nose (dilute): More estery (vinyl); now some fruity notes (boiled sweets – pear drops, acid drops). Development: Nose more fragrant, delicate. ‘Natural’ compared with the other samples. Flavour same as above. Klaus: ‘For me caramel has only marginal influence on the malt. Once this level is reached it doesn’t make that much of a difference if you add some more IMO. c) I think your nose has to be „educated” to tell the difference. You have to know what to look for and I believe the more often you have the opportunity to test different samples like we did the better you’ll become at this. As I said before spirit caramel might actually improve what’s in the glass (or bottle) like the blend I mixed. Charlie: ‘For me this was a fascinating, and somewhat humiliating, exercise. a) Spirit caramel is not ‘organoleptically inert’. This is perfectly clear when you add it to water. b) As one would guess, stronger flavoured whiskies disguise or overcome the aroma/flavour of caramel – but not in nearly as predictable a way as I had formerly thought. I found it remarkably difficult to rate the samples with confidence. My notes are litered with ‘maybe’ rather than ‘probably’ – and few ‘certainly’. c) The claim that it ‘binds’ flavours in a blend is proved, for me. It becomes increasingly difficult to separate out and identify aromas and flavours – which is, after all, the role of the blender, to increase the ‘integrated flavour complex’ – and the overall effect is generally pleasant. UNTIL too much caramel is added when that flavour becomes bitter [It ocurrs to me that maybe this is lost when the beldn is married for a while?]. I will never again be able to taste industrial Scotch with the same gusto! But since we are assured that only small amounts are used in decent blends…no problem. d) For me there is stil the sadness that, when single malt whisky is tinted, you 1) cannot hazard a guess as to what kind of casks (U.S. or Euro; first fill or refill) have been used in the mix, and 2) have some of the aromatic and flavour complexities ‘smoothed off’. But this is a minor complaint, compared with the overall enjoyment of the whisky. 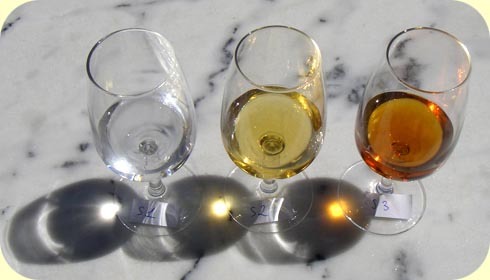 e) Single cask bottlings should definitely not be tinted – but mostly, they aren’t! As a matter of fact, we’re all ready to be shot at, dear reader! We’ll all await the inevitable fallout! What? You’re now sipping that wonderful sherry matured malt… and feel no need to shoot us? Are you sure it’s sherried. Are you?? This is dedicated to all the distillers who realise E150a, used in small amounts, isn’t that bad! Previous post: E-pistle 2013-01: Whisky Clubs: Join One or Start One!